Zuiderdam cruise ship operated by Holland America Line received a full score in recent USPH inspections. MS Zuiderdam which is a Holland America Line cruise ship has received a perfect full score in recent United States Public Health (USPH) inspections. The cruise line can show off its great record as Zuiderdam follows another Holland America cruise ship which got a full score for the 13th consecutive time! The unannounced inspections took place on January 27, 2018, when the Holland America cruise ship was docked at its homeport of Port Everglades in Fort Lauderdale, Florida. inspectors from the Centers for Disease Control (CDC) went on board the vessel while the ship was preparing for an 11-day Panama Canal and Caribbean cruise. Zuiderdam had a full score of 100 which is really impressive. This means the ship’s crew followed the correct procedures and the vessel was in good condition in relation to public health. Inspectors checked many areas of the ship including galleys, dining venues and food preparation areas, storage and more. With all those ticks on the inspector’s checklist, the crew can be happy about their major accomplishment and record towards public health. Holland America’s Eurodam cruise ship recently received full marks for the 13th time in a row. The ship’s latest CDC inspections took place in December 2017 and the hard working crew passed perfectly. Let’s hope the next Holland America vessel also gets a score of 100! In fact, looking back on 2017 USPH inspections for the cruise line all ships were within the 90 score mark with no failures. So while Holand America is ricking USPH inspections, sister cruise line Carnival has not been having such a good time. We’re not going to go too much into detail as we’ve already posted about it all here. The newest ship Carnival Vista failed recently with a pretty low score of 79 where several violations took place. Carnival Breeze received a score of 77 which is even lower and Carnival Triumph got a score of 78 which is just as bad! Even more recently one of favorite Carnival ships Carnival Liberty failed for the first time with a failure score of 80. 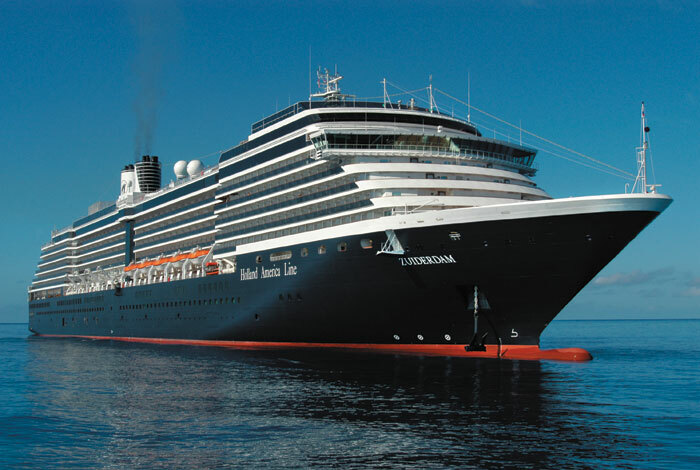 MS Zuiderdam currently operates longer cruises out of Fort Lauderdale, Florida. itineraries include ports in the Caribbean and Panama. The ship is 85,000 gross tons and can carry over 1,900 guests at double occupancy. The ship is fairly new and built in 2002.